Or, you could turn down the lights and subject yourself to an evening of real terror with these so-bad-they’re-good horror movies! The Texas Chainsaw Massacre is one of the grimmest horror movies ever made and is rightfully held up as a horror classic. So, how do you follow it up? Simple: You don’t. When he got round to making a sequel 13 years later, Tobe Hooper decided he’d had enough of bleak horror and made a (extremely dark) comedy instead. It’s still horrifically violent of course – it wouldn’t have been banned in the UK, Australia and Germany (where it’s still banned!) otherwise – but everything from the plot, which sees a DJ helping an old Texas Ranger played by Dennis Hooper get revenge on Leatherface, to the front cover, which mimics The Breakfast Club, seems to be played for laughs rather than terror. And you know what? It kind of works! Jason Voorhees is the king of terrible horror movies and this is possibly the worst – yet most entertaining. Having been captured by the Government so they can research his remarkable death-avoiding ability (spoiler: it’s so he can keep starring in terrible movies), Jason is cryogenically frozen. Over 400 years later, a group of space explorers find him and take him to their ship. That plan goes as well as you’d expect and soon enough Jason is marauding through the spaceship like a hungry dog in a sausage factory. It sounds ridiculous, and it is. But you get the sense that the team behind the film know how stupid Jason X is, which actually makes it quite entertaining. It also has the highest kill count of any Friday the 13th movie, if that’s how you judge the quality of your horror movies. Remember when we said Jason was the king of terrible horror movies? We lied. It’s actually Leprechaun. Leprechaun In The Hood takes a decidedly offensive turn and sends Warwick Davis onto the streets of the Compton with some of the most stereotypical gangstas ever committed to screen. Yes, really. …Warwick Davis raps! Yep, the film ends with Warwick Davis rapping about being an evil leprechaun. To be honest, it makes the whole sorry affair worth it. Remarkably, Leprechaun in the Hood was deemed such a success that they made another hood-themed sequel three years later. Uwe Boll is widely regarded as one of the worst film directors of all time, but don’t tell him we said that because we don’t really fancy having a boxing match against him. Boll specialises in terrible video game adaptations, which makes his adaptation of House of the Dead, the beloved zombie series renowned for its terrible voice acting (honestly, it makes Resident Evil look like The Godfather), a match made in so-bad-its-good heaven. House of the Dead sees a group of good-looking youngsters head to an island for a rave, only to find that the ravers have been eaten by zombies. Oh no! To be honest, it’s hard to get too involved with the plot because it basically gets spoiled in the opening monologue. Instead, sit back and enjoy some of the worst zombies ever committed to screen get blown to pieces by actors who might as well be made out of oak. Oh, and please let us know if you figure out why Boll intercuts footage from the first House of the Dead game into random scenes because we’re stumped. Sometimes, it’s hard to do justice to how bad a film is but we’re going to try anyway. Birdemic is possibly the worst movie ever made, but it’s also one of our favourites. Birdemic sees a town attacked by a horde of eagles and vultures, most of which are made using CGI that looks suspiciously like animated clip art. But they don’t swoop and peck like normal birds, oh no! They actually make dive-bomb sounds and explode on impact. Yep, we’re dealing with explosive birds here people! But wait, that’s just one part of the film! Birdemic is actually a romance at heart, with 40 minutes dedicated to the lives of the central couple. Marvel, as they buy solar panels! Gasp, as fashion model Nathalie is scouted for the Victoria’s Secret cover after a mall photoshoot! Ponder, as the employees of a company applaud for what seems like forever after hearing some good news! Even though it looks like it took all of a week to make, director James Nyugen apparently took 4 years to finish it. To get a distribution deal, he apparently drove around the Sundance Film Festival in a van covered with fake blood and birds. He also had banners on the side which read BIDEMIC.COM (his mispelling, not ours) and WHY DID THE EAGLES AND VULTURES ATTACKED? If you want to find out WHY DID THE EAGLES AND VULTURES ATTACKED (spoilers: the environment or something), we highly recommend you check out Birdemic this Halloween. In the 70s, someone decided that the scariest thing imaginable was giant animals and insects. We got giant bees, giant rats and even giant ants. The pinnacle of the genre, however, is Night of the Lepus, in which a small town is attacked by giant bunny rabbits. And we’re not talking about horrible, evil looking rabbits; we’re talking huge-but-adorable cuddly rabbits…who just happen to eat people. It’s probably the only horror film where we’ve wanted to give the main baddies a big cuddle. 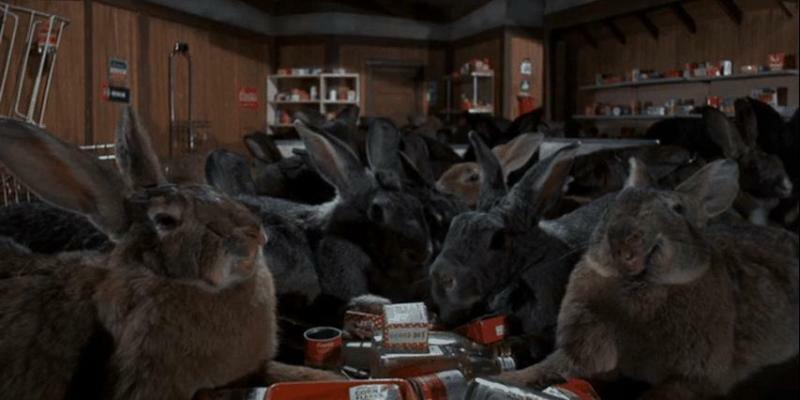 The real charm of Night of the Lepus is the fact that the crew chose to use normal sized bunnies on miniature sets rather than CGI. It’s like watching a home movie made by a slightly aggressive (and possibly disturbed) toddler. Need some cash to fund your Halloween shenanigans? Sell DVDs today and get paid on the same day we receive them! Click below to get an instant price. What is the longest running film series of all time?